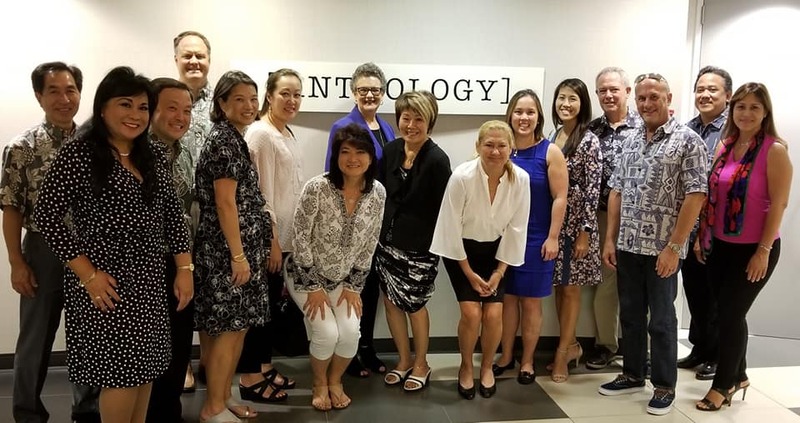 On November 28, the members of HSBP were lucky to receive a full tour of the 2 floors occupied by the 100+ employees of Anthology Marketing Group, Hawaii’s largest marketing and advertising firm. The tour was led by Mary Fastenau, President of Digital and one of the founding partners of the firm. She was joined by HSBP member Erin Kahn, who works in their PR department. We learned that “marketing” does not begin to describe this full service company, which was formed in 1995 with a merger of Laird Christianson and Starr Seigle, the two largest marketing firms in town. After experimenting with different names for a few years, the company came together as Anthology in 2007. The company has four specialities: Research, Advertising, Digital, and Public Relations. The research department recently received a boost by the promotion of David Pettinger, who also addressed the group and described the extraordinary separation of research from the rest of the firm, a process driven by ethical priorities. Plenty of treats (from their client, Foodland) greeted the group at the end and we enjoyed some time to talk and ask questions. It was a great end to a workday enjoyed by all.